Now to continually go back, absorb it, then put it to use! So many great things to pick up in this course. The contributors did it an outstanding job!! I am dragging my feet a bit completing the tree in the hope that traditional character support might come along soon. 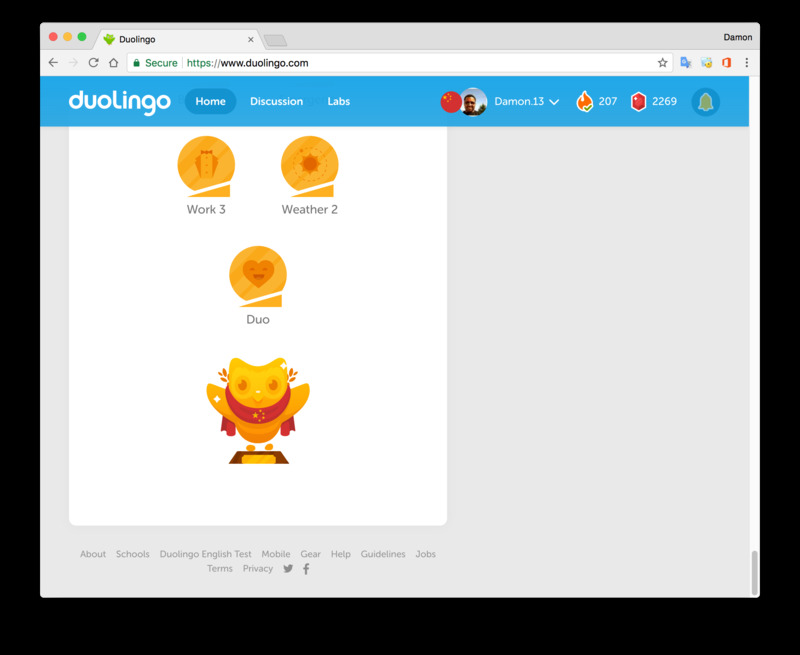 I'm very impressed at the quality of the course, though, especially considering how quickly it was put together and that it is the first in a language unlike any others on Duolingo. BTW, would someone please show me how to post a screenshot in here?
! (URL-OF-IMAGE) Imgur is a convenient host. Thanks garpike! Took me a while to figure out how to get the URL but I eventually did. Have a Lingot my fellow language enthusiast. Congratulations! Best wishes on your continuing journey with language learning. Thanks MV, the best to you, too! I see you have a really long streak. I admin a club called Streak Keepers. Openings are somewhat rare because the members are very motivated, but occasionally someone drops their streak or stops their weekly participation. If you, or any long-streaker reading this, ever see an opening in the club, I welcome you to join us. Club code is below. I was moving through the tree slowly trying to perfect everything first. But I have recently decided to just go through the whole course and do like yourself. Complete it, continually go back to absorb it all, and put it to use. I am about 40% through now. Let's see how long it takes me to finish. Thanks LE, you are working hard on Chinese!! You were an alpha tester also, right? I've had a working grip on Mandarin for years. I pushed through the course to find bugs, awkward translations and such; and Duolingo has replied to well over 100 of the things I've found. Honestly though, without prior experience, I would likely still be in the first section of the tree. Duolingo's course is excellent for learners in the intermediate - advanced levels of understanding, but I think this it is quite challenging for newcomers. If I would offer advice it would be this: don't strive for perfection, strive to be understood when speaking, listen closely to each syllable, listen deeply to the 'music' of each phrase, imitate the speaker, find a patient native speaker and struggle to converse with what you have learned, listen to their responses and adjust accordingly. Wash, rinse, repeat. I'm going through the tree again to find areas where they highlighted really useful sentence structures that I should be using more often. I'll focus on one structure at a time until it is second nature. Keep on going LE! This is a beautiful language. Great advice and thank you for the little bit of insight on the Duo tree. TBH, I wasn't sure if moving forward would be the best idea or not. I have made it through about 30 lessons and I started having trouble remembering the 汉字 I had learned. At this point, I am also learning something new when I go back to completed lessons. Whether through sentence discussions, Google searching information on the "Why" of the sentence structures, or studying 汉字 I had forgot. Now hearing that you have previous experience in 普通话, I think I will keep the pace a bit slower and not push too quickly. I am also speaking with a friend from 北京 2-3 times a week. Hopefully, this will train me to be a competent natural sounding speaker. And, yes I was an Alpha tester. Congratulations again on being one of the first people to complete the tree. Thanks Igucel! It is a very good course. Stick with it! Thanks PC; by the way, nice streak!! I'm trying to be as consistent as you.
" The contributors did it an outstanding job!!" No, they didn’t.. Just think about how many times you should have leveled-up, but you didn’t because your correct sentence has not yet been added to the list of accepted answers... and when you report it, it takes months/years to get the answer accepted. The chinese course is a big disappointment (for now). i think is not possible to post SS. I have owls in both the English=>Chinese and the Chinese=>English, but still not level 25 in either. I have found working both trees gives me more opportunity to read and hear Chinese. My goal is to be golden in both trees, but I am in no hurry. On another note, I have hit a mental wall in Vietnamese, and I will start the reverse tree there in the hope of hearing and reading that language more. I am hopeful about that. Again no hurry.